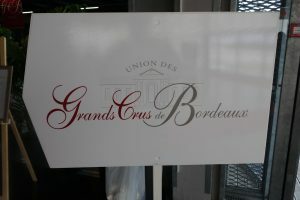 For the past several years, I have been invited by the Union des Grands Crus to take part in a mammoth tasting organized during the Weekend des Grands Crus. This is always a wonderful experience and the 2017 tasting on the 20th of May was no exception. 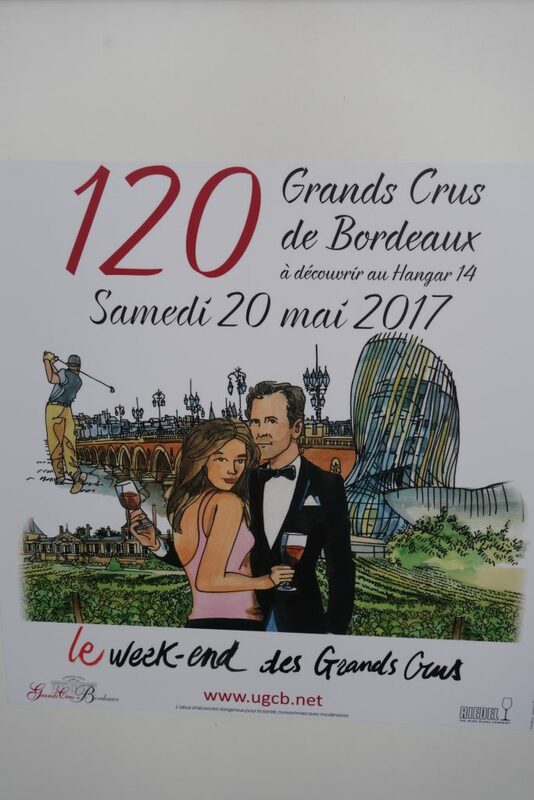 Open to the general public, the UGC Weekend includes wine country tours, dinners in famous châteaux, a golf tournament and the monster tasting on Saturday with some participating 116 châteaux. 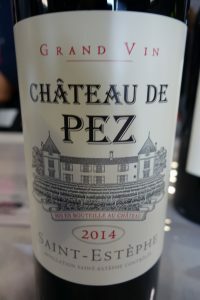 The tasting takes place in the city of Bordeaux in a single huge room in a former warehouse, H 14, overlooking the Garonne, not far from the new Cité du Vin. Every UGC member is asked to show two wines: one from the same vintage (the 2014 this year) and another of their choosing. Most estates are represented by their owner or general manager, so this is a rare opportunity to meet the people who actually make the wine and talk with them. The tasting lasts from 10 am to 5 pm. Snacks are available as well as a sit-down lunch accompanied by older wines. The tasting is well attended by wine lovers from all over the world. The choice of wines is so great that I usually decide to focus on one region in one vintage. This year’s choice was 2014 Médoc. C: Lovely, bright, medium-deep color. N: Open, fruity, and plummy with graphite overtones. Expressive, subtle, and more elegant than usual for this château. P: Unfortunately unbalanced because hollow on the middle palate. Starts out fluid and free-flowing, and then turns hard. The aftertaste is rough, and this is a shame after such a fine bouquet. C: A little dull, but good enough with a thin purplish rim. N: Lovely marriage of fruit and oak. Pretty rather than deep, although there is an attractive uplift. Nevertheless hides its light under a bushel. P: Round and soft on the attack, then segues seamlessly in a fine structured aftertaste. More elegant than powerful. Medium-light in body with blueberry and blackberry flavors, as well as a tannic finish that indicates the wine is for mid-term drinking. C: Relatively dense with a medium-deep purplish rim. N: Fresh, upfront, and seemingly unoaked fruit with ethereal graphite aromas and cherry nuances in the background. P: Somewhat lightweight for a Saint Estèphe. A good cru bourgeois not pretending to be otherwise. Relatively short aftertaste. C: Medium dark core with a vibrant purplish rim. N: Underwhelming blackberry aromas. Sweet but not very expressive. P: A thirst-quenching, tangy sort of Médoc with fresh acidity. Light for a Saint-Estèphe. Shortish aftertaste, but with decent, slightly rubbery tannin on the finish. N: Underdeveloped (more understated or lacking in expressiveness?) at this time with black cherry and sweet cosmetic/perfumed aromas. P: A little dilute, but well-constructed. The tannin on the finish makes this a serious wine, but one best enjoyed on the young side. Fresh and well-made, but not a heavy hitter. C: Medium-deep with a youthful rim. N: Lovely. Ultra-classic fresh nose of super Médoc. Blackberry, black cherry, cassis, and earth. Subtle and perfumed. P: Rich, soft, and mouthfilling on the attack followed by a flawless development towards a long fresh aftertaste. Fruit and tannin are very much in balance accompanied by that extra something that can only come from a fine terroir. Medium-bodied and truly elegant, this is not a huge wine, but one that will please claret lovers. C: Medium and not particularly brilliant with a thinnish purple rim. N: Too indeterminate at this stage. Some graphite there, but the bouquet is not quite up to grand cru level even though it is quite fresh. P: Better on the palate. Tight and brambly, delicious and appetizing. Lovely texture with a classic, long, velvety afteraste. Well-made. A sleeper. The bouquet may not be expressive, but let us hope this comes around in time. C: Attractive deep colour with a fairly watery rim. N: A sweet, fresh, immediately rich and satisfying nose with hints of graphite, kirsch, and toasty oak. P: Full-bodied, round, and with tannin that melts in the mouth. Penetrating, and then drops off somewhat before picking up again on the tannic aftertaste showing candied fruit and coffee overtones. A compromise between a classic and a crowd-pleasing commercial style. Open and attractive. C: Medium-dark with a wide purplish rim. N: Showing sour cherry and berry fruit aromas, but underdeveloped at this time. There is a spirity quality here (blackberry liqueur). P: Mouthfilling with sweet fruit, but there is some hollowness on the middle palate and dryness on the finish (too much oak?). Long aftertaste, but the oak is intrusive. A little top-heavy and clunky in this vintage, but I hope I will be able to revise my opinion down the road. C: Medium-deep with a watery purplish rim. N: Expressive bouquet of primary fruit and toasty oak. Simple and forthright, with some graphite. P: Starts out solid, going on to reveal fine-grained tannin. 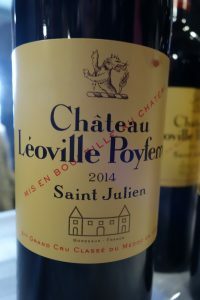 A natural, undoctored kind of Médoc with some dry oak on the finish. Not the red fruit flavors I would have hoped for. Tangy, medium-long aftertaste with good grip. The type of wine that is good young or old. Good value. C: Fine, youthful, and vibrant, including the rim. 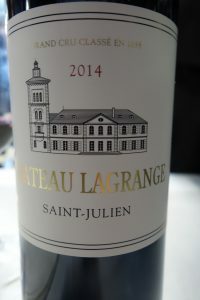 N: Very typical of the Saint-Julien appellation with some graphite. Good, but not great. P: Creamy, rich, and mouthfilling. 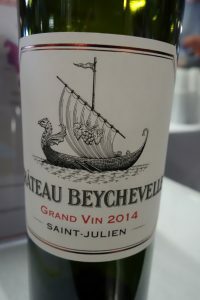 Very long, tangy aftertaste with fresh acidty and red fruit flavors, especially strawberry. Needs loads of time. Promising, but not showing especially well at this time. C: Deep core, but also a very youthful color on the rim. N: Subtle bouquet of candied cherries with some truffle overtones and a fascinating unpindownable floral element. Class rather than power with toasty oak bringing up the rear, but very much in harmony. P: Sweet without being sweet… Tremendous black fruit and candied cherry flavors. Unfolds beautifully on the palate into a fine aftertaste consistent with everything the precedes. A long, long finish with bright fruit. Could perhaps use a touch more richness and volume, but this is a very fine wine indeed. C: Very deep and not totally clear. Thin rim showing different shades. N: Concentrated bouquet of blackcurrant and throat lozenge. A little spirity. 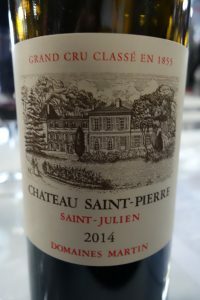 P: Sweet and soft on entry, dips somewhat, and then comes back with significant, but not overdone oak. Fresh with a medium-heavy mouth feel. Some dryness on the finish. Very good, but not excellent. Reliable. 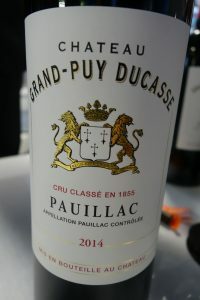 The first vintage sold in a bottle embossed with the château emblem. 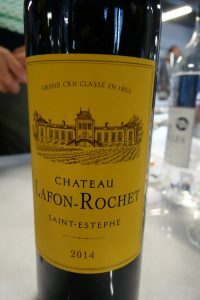 C: Comparable to the sister château, Gloria, tasted just before, perhaps looking a little more dull. N: Fresh, subtle, and floral, with some candied black fruit and truffle nuances. Very interesting. P: Starts out sweet and with the chunkiness I associate with Saint-Julien. Joyous, exuberant fruit that goes just a little too quickly into a dry aftertaste. The oak needs to blend more with the fruit. C: Lovely dark colour, much deeper than the other wines. P: Mouthfilling, seems rather chunky and then thins out some. Controlled tannin on the aftertaste. Lovely finish with oak playing the role it should. Lacks some richness and depth, but very well-made. C: Vigorous and deep with a bright purple rim. Brilliant, very good. N: Forest floor and a definite greenness to accompany the traditional hallmarks of Pauillac. A certain herbaceousness needs to integrate better with age and/or aeration before serving. C: Not totally limpid. Medium-deep core. N: Toasty oak dominates at this point and the nose smells more like coffee than wine… However, black fruit nuances are lurking. P: Hard oakiness overlaying good back fruit, but this oak is just too much, and I do not see how time can overcome the imbalance. Dry finish. C: Deep, with purplish tones throughout. N: Toasty oak, but in tune with the red fruit aromas, along with black cherry and truffle notes, as well as a touch of eucalyptus. Not celestial, but very good. Understated. C: Light and not very clear or appealing. P: Smooth, light, and not much there. Rough tannin on the aftertaste. Off notes. 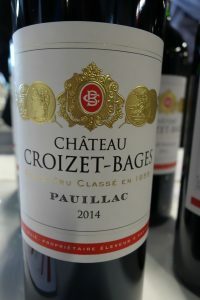 I keep trying with Croizet Bages, waiting for the estate to be turned around, but that time is still in the future. C: Medium in every respect, with a purplish rim. N: Rather rustic with hints of pencil shavings as well as odd and unexpected tropical fruit aromas! P: Smooth, short, and simple. Dilute and ends with dry, bitter tannin. Not a winner. P: A little better, but the bretty quality overshadows the rest. C: Very dark, much more so than the other wines. N: Fine, subtle oak with trademark black fruit (cassis) and graphite aromas. Overtones of blackstrap molasses and coffee, but the aromatic profile is still largely closed at present. P: A touch green, and acidity coats the teeth. 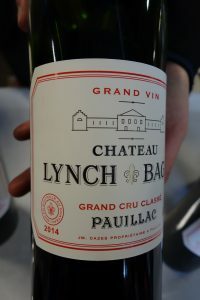 This is a good Lynch Bages that will age well. C: Medium intensity with a watery purplish rim. N: Not much fruit. Toasty oak and caramel overtones. 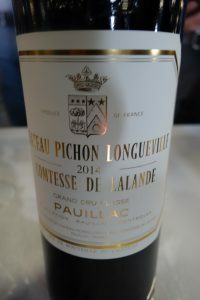 P: Starts out sweet, then becomes hot and oaky with granular tannin on the finish. Out of balance. More fruit and less oak needed. There is also a slight greenness on the finish. C: Very dark color, one of the best of the tasting. The rim is red rather than purplish. N: Roasted aromas (coffee) and reticent black fruit. Pure and fresh. P: A big wine with medium-heavy mouth feel. 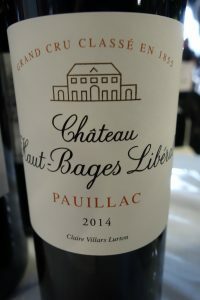 Luscious and ticks all the right boxes for Pauillac. Smooth and requires medium-term ageing. Spreads out beautifully on the palate. The tannin less virile than in many other vintages of this wine. Wonderful. C: Medium-deep with a purple rim. N: Candied red fruit. Sweet, but not yet complex at this stage. Surprisingly, a little rustic and not showing particularly well at this time. P: Better on the palate, which shows marked fresh acidity and a blackcurrant flavor. Seems a little harsh and needs to age. Should be revisited at a later date to re-evaluate. Posted in Uncategorized and tagged Bordeaux, BordeauxWines, medoc-bordeaux, Pauillac, Saint-Julien, vavino, winelover on June 19, 2017 by AlexR. Everybody loves a success story, and Sociando Mallet certainly falls into that category. When Jean Gautreau bought the estate in 1969, there were just 5 hectares of vines. There are currently 85! However, it was not only production that increased. Sociando Mallet also built up a solid reputation for quality and established a loyal following. 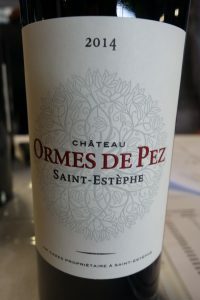 The vines grow on a rise overlooking the Gironde Estuary east of the village of Saint-Seurin-de-Cadourne, the northernmost commune in the Haut-Médoc appellation. The soil is very gravelly, with a clay-limestone subsoil. The first time I tasted 2002 Sociando was at the Darroze restaurant in Langon, where I had been invited to lunch by Xavier Gonet-Médeville of Ch. Gilette in Sauternes. This was about 5 years ago and the wine was quite closed at the time. The situation was compounded by the fact that young wines rarely have the chance to open up in restaurants, even when properly decanted. Anyway, by August 2015, this wine was, unsurprisingly, much more developed. It was decanted 3 hours before the meal. The color made the wine appear younger than its age. As for the bouquet, Sociando is noted for displaying a decided green pepper quality in certain years, to the point where some people have found it too overpowering. The 2000 vintage is a case in point. Personally, I have never felt this way, but that green pepper factor was there in the 2002, albeit in an understated way. The wine has a velvety texture and good grip on the palate. 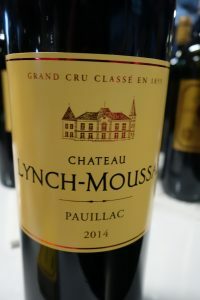 It also seems to share characteristics with nearby Pauillac. My friends know that I prefer my wines on the young side, but at 13 years I must admit that this is still not all it could be. It is heady and virile, the perfect wine to have with red meat, making up in vigor and assertive Cabernet fruit what it may lack in elegance. That having been said, Sociando Mallet has just 48% Cabernet Sauvigon (and 5% Cabernet Franc), but this variety seems to dominate the flavor profile. I have visited Château Talbot, a 4th growth Saint Julien only once, a long time ago, and have not tasted their wines as often as I’d like to… I have a fond memory of the odd proprietary bottles the Cordier estates used to come in, with a picture of old man Cordier and his white moustache on the embossed part. 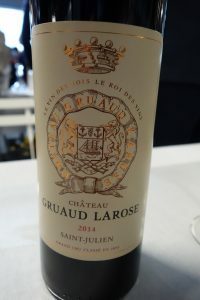 Times have changed, and most of those estates (Gruaud Larose, Meyney, Lafaurie-Peyraguey) have now been sold. 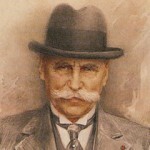 Château Talbot, though, acquired by Désiré Cordier in 1917, has been in the family ever since. 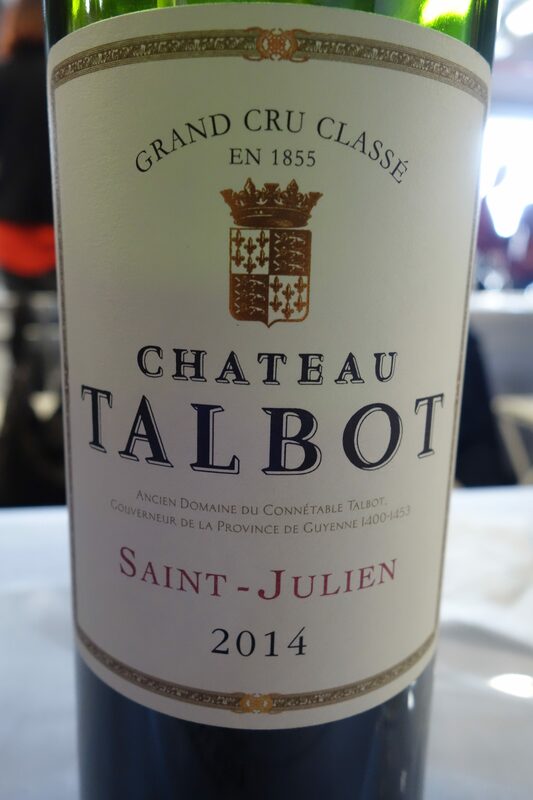 Talbot has 106 hectares of vines, which is absolutely mammoth in Burgundian terms, and big even in Bordeaux. 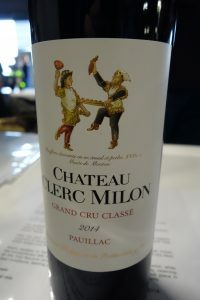 They also make a small quantity of white wine, Le Caillou Blanc, AOC Bordeaux. I had just one bottle of Talbot in my cellar, from the 2001 vintage, one usually overshadowed by 2000. 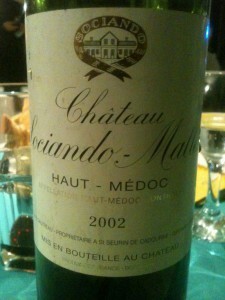 However, I’m a huge fan and it is not rare for me to prefer a 2001 to the 2000 from the same château. So, we enjoyed the 2001 Talbot just after the Sociando-Mallet. The Talbot is the weightier wine, with a deep regal color. The nose is gorgeous, everything I love about the Médoc and classic Bordeaux. 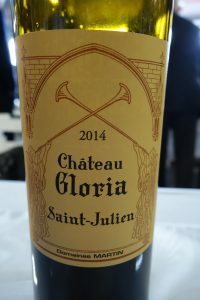 It smells like a room with old mahogany furniture polished with beeswax, as well as subtle, pure blackcurrant fruit – none of the famous bretty/phenolic odors sometimes referred to as the “Cordier stink” that existed years ago… The wine is also very traditional, refreshing, and well-balanced on the palate. It is a lovely drink, and while not at its peak, is not far off. 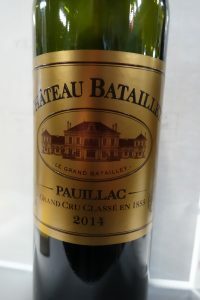 This 2001 Talbot is an excellent wine to serve to people who think that “modern Bordeaux” is over-extracted, over-oaked, and over-alcoholic. In fact, it is just the opposite. 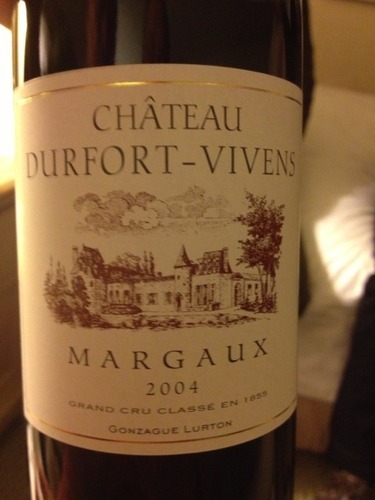 Château Durfort-Vivens is one of several great growths owned by the Lurton family, but it never seems to attract the same attention as the other Lurton great growth in Margaux, Ch. Brane-Cantenac. 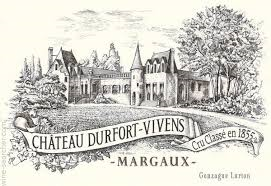 The fact that Durfort has 55 hectares of vines compared to Brane’s 75 may have something to do with this, but that doesn’t explain everything. 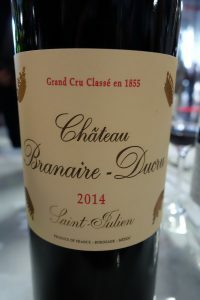 I once enjoyed a lunch with Lucien Lurton and he told me that the “dur” (meaning “hard”) in Durfort describes the wine’s character. It is perhaps this slightly austere and unyielding side when young that makes Durfort less popular. 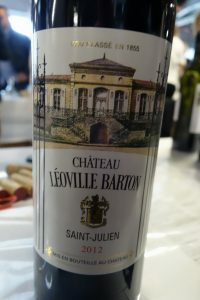 The Lurtons sold the actual château building to Philippe Porcheron, who renamed it Château Marojallia. 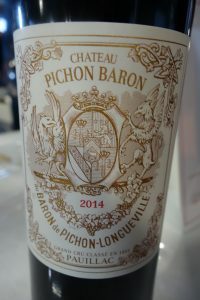 The château is now a luxury hotel as well as the name of the AOC Margaux garage wine Monsieur Porcheron produces. 2004 Durfort Vivens has a browning rim and dark core, with thick legs. 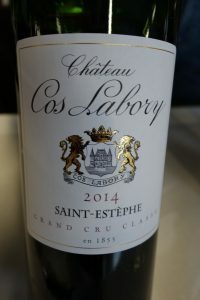 The nose is soft and smoky, with subtle cosmetic and chocolate overtones, along with a major earthy/truffle component. 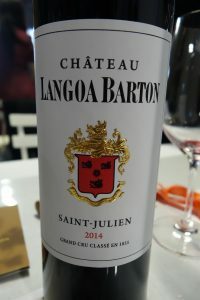 The wine starts out smooth on the palate, showing textured tannin, but the finish unquestionably displays that Durfort hardness, and the wine is starting to dry out. 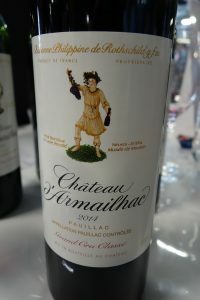 While enjoyable at table, this smelled better than it tasted, and the balance is such that any evening-out of the tannin in a few years will leave the fruit behind. In short, I am somewhat disappointed, especially since I rated the wine highly when tasted en primeur in spring 2005. 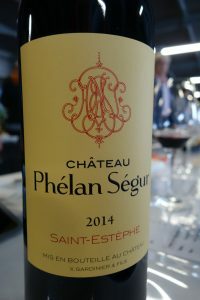 Posted in Uncategorized and tagged Bordeaux, Margaux, Médoc, Pauillac, Saint-Julien on August 16, 2015 by AlexR.